Providing food and shelter to the poor and impoverished children and families of Debre Zeyit is a lifesaving work but… we want to break the cycle of poverty. We want to enable our children and families to become self-sufficient to help themselves and to help others. We can’t accomplish this goal by just meeting their immediate needs and not giving them opportunities to grow, learn and development. For children, we are accomplishing this goal by ensuring they receive a good education, which is the foundation to an independent future. For adults, this goal is being met through our Income for Life Programs such as The Spice Project, Beekeeping, Agriculture and Food Production Programs. Another program we offer is the Loom Program. We currently have 20 widows working on nine looms, 5 of which are metal and 4 are wood. Working on a metal loom. The women have been trained to use the looms to make scarves, which are a staple for all women and girls in Ethiopia. The scarves are worn in a variety of ways but the most traditional way is wrapped around the head. Surprisingly, 80% of scarves in Ethiopia are imported so by hand looming them, we are able to provide a superior product for a more reasonable price. To keep costs low on the startup and future production, our National Director, Dawit Moges, has found a way to reverse engineer the looms and save us almost $1,200 each! Dawit is a blessing to the ministry as he has a heart for people and a mind for business. Using this skill, he purchased a new metal loom from the market for $1,420 and was able to reverse engineer it to create four more looms for just $240 each. Saving this money means the women can start seeing profit from their work sooner! It has been so inspiring to watch the women’s dedication and perseverance as they learn a new skill that is enabling them to support their family. If you would like to be a grassroots supporter of this program, a gift of just $300 will purchase a loom and start up supplies for one woman to begin working towards her future. You can make your donation online, via mail, or phone. Every dollar helps! You can also purchase a small selection of scarves (and baskets) made by the women in the program through an online Etsy shop – Weaving Blessings. 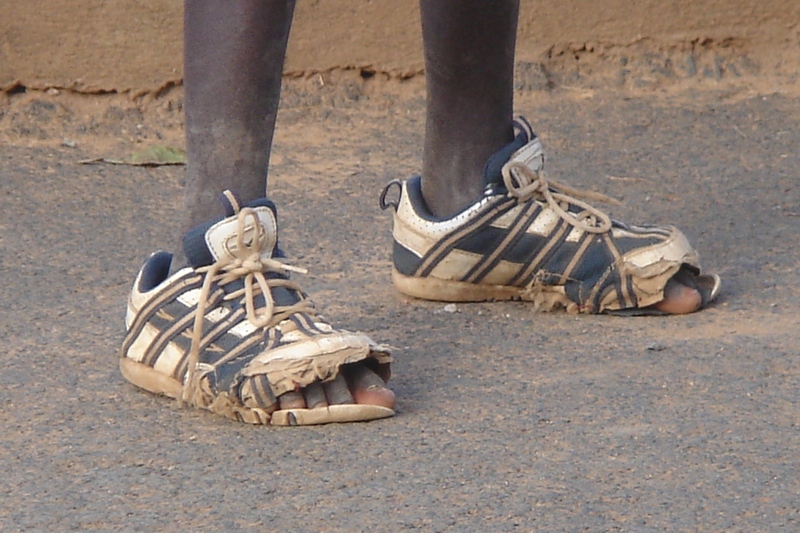 Up until recently, shoes were not common place in Ethiopia. Even now, many people in Ethiopia cannot afford shoes and there are remote parts of Ethiopia where shoes are still not available or worn. 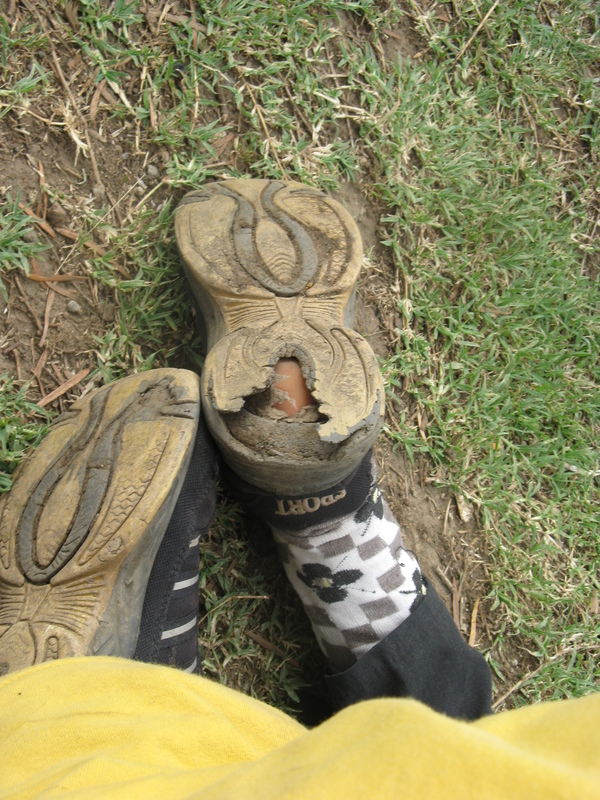 But going barefoot in Ethiopia can be dangerous. Without shoes, children are susceptible to injury, disease and even loss of limbs because with no health insurance and no money for health care, a small cut or injury on the foot can quickly fester into more. 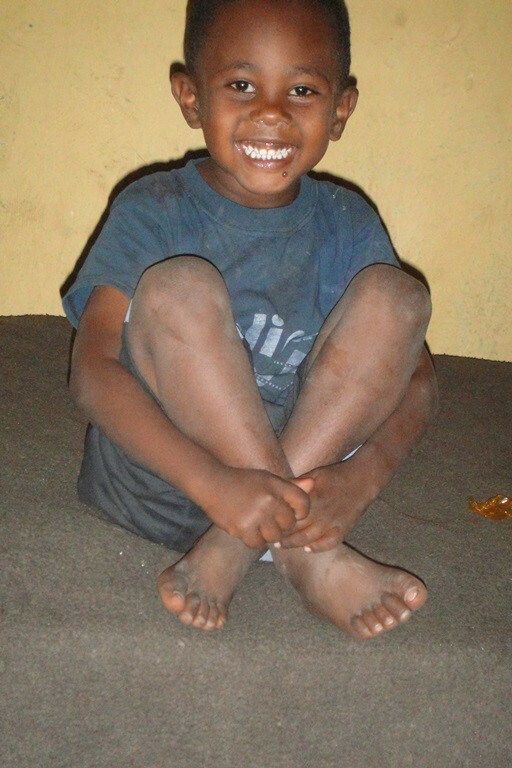 Would you partner with us this Christmas to protect the precious little feet of every child in the BCI program? For just $12, we can provide one child with a new pair of shoes to keep their feet safe as they run, jump, play and savor the joy of being a child. The last time we were able to provide every child a new pair of shoes was two years ago and with how fast growing and active those little feet are, many of those two-year-old shoes have been outgrown, handed down, and worn out. 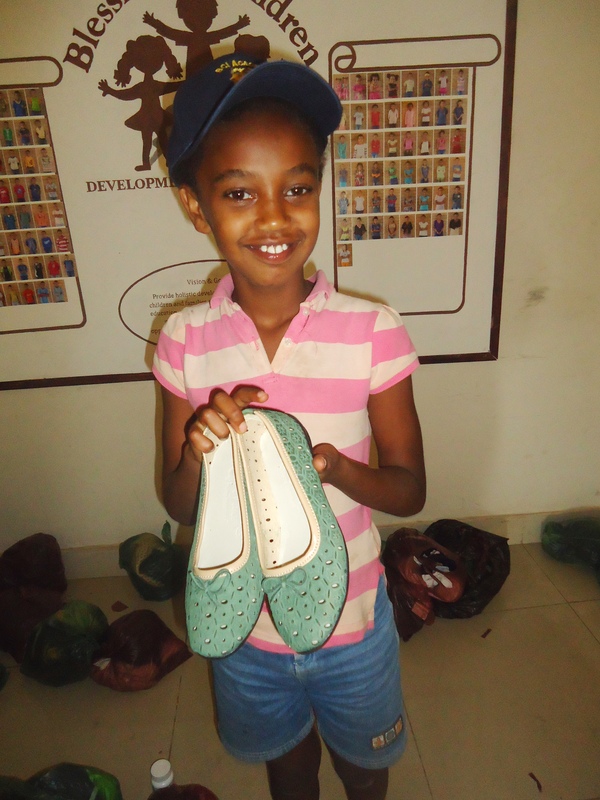 To provide every child in the program with a new pair of shoes this Christmas, we need $2,424. 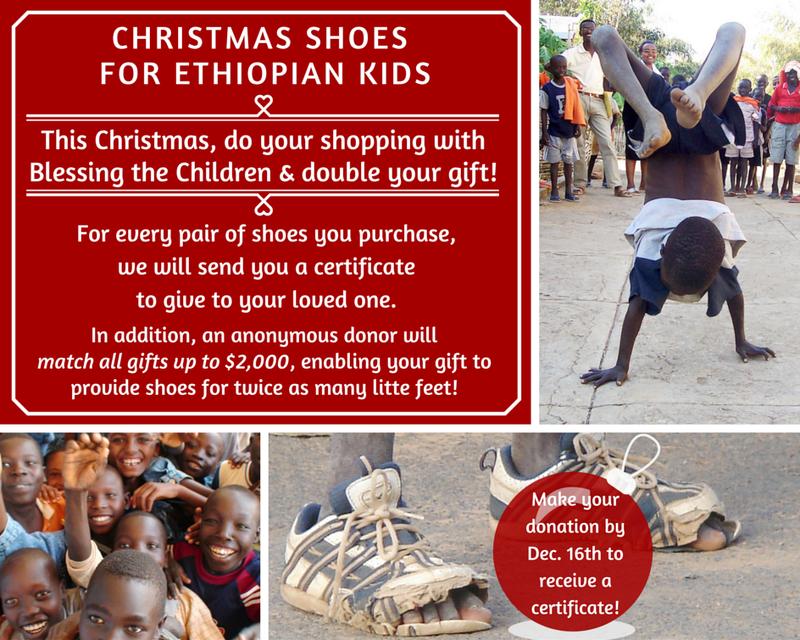 Are you able to provide a pair of shoes for one child? Maybe you’re able to provide five children with a pair of shoes? If you’re unable to make a donation towards this need, perhaps you will share it with your friends and family this Christmas and help us meet our goal of protecting all the little feet in the BCI program! The BCI Social Workers and staff are quite simply amazing! Their dedication and commitment to the children and the work of the ministry was both challenging and inspiring to me. Each one of them is so gifted by God and has such a heart for the work they are doing. Blessing the Children is doing the work of the ministry and it is working! You can literally see the difference in the children enrolled in the BCI Program and those on the streets and in the neighborhoods. The BCI children appear healthier, better nourished, better clothed, happier! They are attending school. They are involved in church. And if you go meet them, they will climb right into your lap and into your heart. I thought I was going to bless the children, but it turns out I was the one who was blessed. I will never be the same. And, I am now the proud sponsor of two BCI children! I am so grateful to God for allowing me this opportunity. What a privileged it is to participate in His work through Blessing the Children! I really enjoyed going on home visits with the social workers and being with the children. I felt relaxed and comfortable and had a lot of fun. The BCI staff were fantastic and treated us like family. It was great to see their love and dedication in how they care for the children and families. God’s love truly shines through your people. We had beautiful accommodations and the staff had great pacing each day – not too jam packed and not too slow. We were busy but not exhausted and the staff was sensitive to our physical well-being. We had a great variety of activities in which we participated – I liked that. The staff was also always looking out for our safety and letting us know what we would be doing next. This was a fabulous experience and the organization prior to the trip (from the U.S. office) helped things flow smoothly. After actually meeting several adults and numerous children in the city of Debre Zeit, my admiration for these people grew like wildfire. Whether I was doing a home visit with one of the many lovely social workers, fixing up a home, or teaching English at the BCI academy with Kelkias or “H”, I saw God’s beauty in the people. Through their smiles, hugs, and laughter I felt their faith and love for God. Now after 3 mission trips through BCI I can’t imagine my life without Ethiopia. We have started a missions day at our local church camp, have missions retreats and I present at different churches in the area. The Lord is doing HUGE things in Ethiopia and I am blessed to be a part of His plan. Sometimes while in Ethiopia, I found myself thinking: “This is it, right now, I am living my dream.” I made myself a promise. I will not to live my life for myself, not let my life be a grind and live for work, money and a big house. It is worth it to take risks and to overcome challenges, so you can shine and let others shine. Our world needs people to color it and to bring hope! In the middle of so much desperate need, God broke through the darkness and shone his light into a wounded heart and allowed us the honor of being his vessels to set in motion the change of a lifetime. The joy of walking through the door of opportunity God opened before us. The chance to pour love into a woman who was lost in a world of mere survival and sin. When I think back to the many people I met at the school, foster home, or on social visits, I remember huge smiles and welcoming embraces. I arranged my mission trip with B.C.I. in the hopes of helping to make a difference in the lives of the people and children of Ethiopia, but I think that the biggest difference made was the one they made in my life.